Here are the fundamentals of howcredit bureau scores are referred to as “FICO scores” because most credit bureau scores used in the U.S. are presented from software developed by Fair Isaac and Company. Every time you execute a request for credit – whether for a credit card, car loan, or a mortgage – lenders want to understand if you are a good risk they ought to take by loaning money to you. 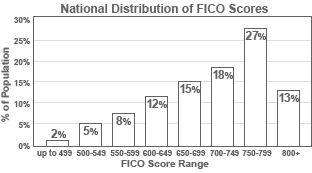 FICO scores are the credit scores most lenders use to decide your level of credit risk. This is how your 3 FICO scores affect both how much and what loan terms (interest rate, etc.) lenders will offer you, based on your current qualifications at any given time. You have three FICO scores, one for each of the three credit bureaus: Experian, Equifax, and TransUnion. If you are willing to take steps to improve your FICO scores can help you qualify for better rates from lenders. Recognize that each score is based on information the credit bureau keeps on file about you. As this information change, your credit scores incline to change as well. The process by which your three FICO scores to be computed, each of your three credit reports must contain a minimium of one account, which has been open for at least six months. In addition, each report must contain at least one account that has been updated in the past six months. This will ensure that there is enough information in your report on which to base a FICO score on each report that the bureus provide from information they recieved. FICO scores are provided to lenders by the major credit reporting agencies. Remember that no score says whether a specific individual will be a “good” or “bad” customer. The FICO scores provide the best guide to future risk based solely on credit report data. This means that the higher the credit score, the lower the risk. So while many lenders use FICO scores to help them make lending decisions, each lender has its own strategy. This will usually include the level of risk it finds acceptable for a given credit product. Please remember there are many additional factors that lenders use to determine your actual interest rates. There is no single stop point score, which is used by all lenders. Some of the FICO scores have different names at each of the credit reporting agencies. All of these scores, however, are developed using the same methods by Fair Isaac, and have been rigorously tested to ensure they provide the most accurate picture of credit risk possible using credit report data to create the score. Your credit score will usually be different at each of the main credit reporting agencies. The FICO score from each credit reporting agency considers only the data in your credit report at that agency. If your current scores from the credit reporting agencies are different, it's probably because the information those agencies have on you differs. Credit bureau scores are not the only scores used. Some lenders can use their own credit scores, which often includes the FICO score as well as other information about you. FICO scores are not the only credit bureau scores. There are other credit bureau scores, although FICO scores are by far the most commonly used. Other credit bureau scores may evaluate your credit report differently than FICO scores, and in some cases a higher score may mean more risk, not less risk as with FICO scores. Your FICO score usually changes over time. The reason your FICO score from a month ago is probably not the same score a lender would get from the credit reporting agency today.This is why your data changes at the credit reporting agency, so will any new credit score based on your credit report and your current situation.